Ally and Ayla - your colorings are splendid. Ayla: Love the gold and the blue on the chair. Here is a one of Alix. Sadly, I failed brutally so I will have to give it another try soon. Awesome work everyone! I haven't posted for four years, but I have recently decided to take up coloring again. Here is my colorization of a photo of Ella. New to me as well. Wonderful to see new photos from that famous session. Thank you! The first two official photos of princess Leonore Lilian Maria, countess of Gotland. Her name has just been announced - princess Leonore Lilian Maria, countess of Gotland. Her name will be announced at 3 PM continental time today. After what I've heard, she is to have five names and "experts" think that Sibylla (after princess Sibylla - Madeleine's paternal grandmother) will be one of them. 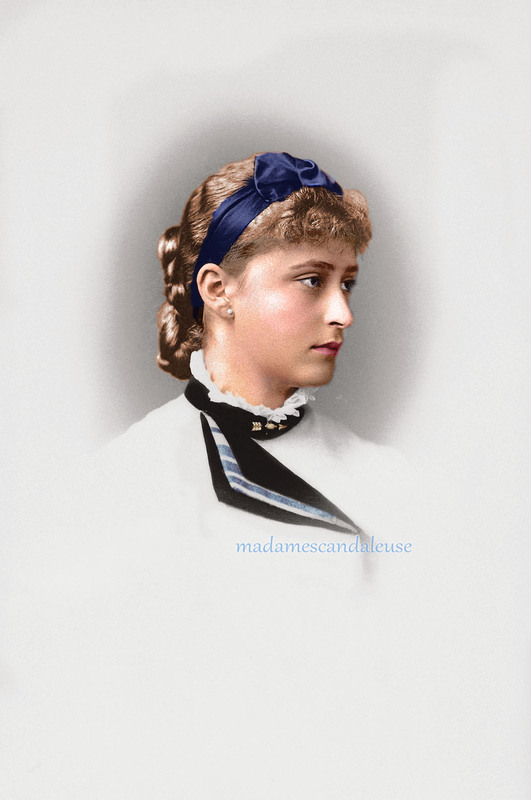 I tend to think of Alexandra as a hypochondriac who, consciously or not, rather enjoyed being treated as an invalid. If you read John Rohl's book 'Purple Secret', porphyria tends to manifest itself in digestive problems and periodic high fevers (in George III's case the delirium from these was mistaken for madness). William of Gloucester's porphyria manifested itself mainly in skin trouble. As far as I'm aware, Alexandra did not suffer from any of these. That's not to say that she did not have porphyria to a minor degree, but I think that most of her medical troubles were psychological in origin. She did have some skin trouble, did she not? She suffered from "blotchy skin", but judging from pictures - her skin problems were not as severe as people suffering from porphyria. I always suspected her of suffering from rosacea - hence her "blotchy face" and painful eyes. This morning the royal court announced the birth of a daughter to Madeleine and Chris O'Neil. Madeleine gave birth to a daughter on February 20 2014 at 10.41 pm local time New York. Both mother and child said to be in good health. According to previous reports, the child will be bestowed the title princess - which I feel is a bit odd. I dream a lot, not very much about the Romanovs though. I usually end up in a concentration camp in my dreams. Absolutely terrible! However, I do remember one Romanov dream. I was Alexandra and Nicky and I were in bed, asleep. Suddenly, the revolution struck and we woke up. Everything was on fire. My first thought was; "Oh my god, I must save my diamonds". I jumped out of bed, ran across the room, opened "my" jewellery box and stuffed my mouth with diamonds. A moment later I woke up, completely sure that I still had the diamonds in my mouth. Dreams can be very very strange! Tsarskoe Selo . Spring 1916. This photo is just amazing! Alix is looking remarkably young and well. Judging by the body and lips, I would say that it is Maria. 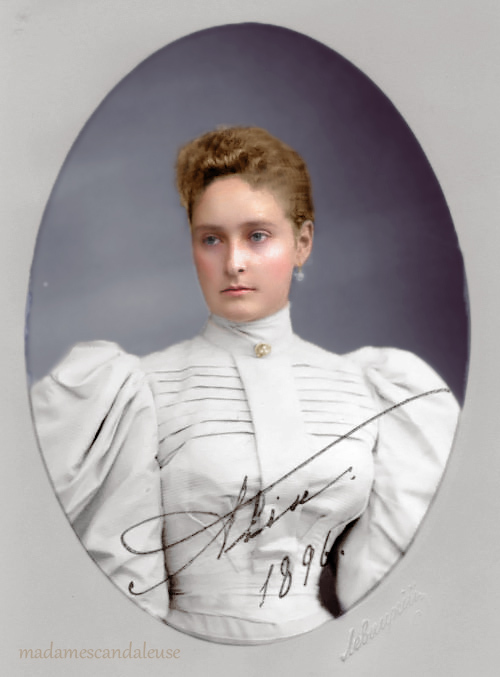 The Myth and Legends of Survivors / Re: Tatjana Angilini - Alexander III:s illegitimate granddaughter? I found some more information, not much - but some. According to an old book which I found among my grandma's old things, Tatianas father fled Russia in 1917 by boat. Apparently, he used his mother's surname Angelini to avoid persecution. "The tsar with the dragon tattoo"! Hahahahahahaha! Brilliant!